Lenz Frenz® stuffed animals offer a non-threatening, inviting way to encourage children to accept, and even cherish, their glasses and to introduce a “friend” during a time in their lives when children may need an extra touch of comfort and love. 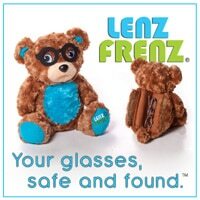 Every Lenz Frenz® is a cute, cuddly stuffed animal that encourages children to be responsible with their eyeware by teaching them to put their glasses or contacts away in a safe, fun way. Each animal comes in two sizes. The larger 14-inch animals include a padded hard case for glasses, while the 6-inch-tall Li’l Lenz Frenz® critters each harbor a case for safe storage of contact lenses. Proceeds from sales support the work of Preserve Vision Florida, a non-profit organization offering 59 years of vision education and services to Florida’s children and adults. Our focus is promoting a lifetime of healthy vision care through advocacy, education, screening and research. Lighted Magnifying Readers™ help you focus on everything in front of you — no matter how dark the room! With precision LED lights built into every pair of these premium reading glasses, you’ll have no problem with restaurant menus, bedtime books, arts and crafts, handyman projects, and more. Lighted Magnifying Readers™ include four easy-to-replace batteries that provide up to 40 hours of use, along with a case and a one-year limited warranty. Shop now.